While I agree with most of what other reviewers say about this DVD, I have to disagree with both Amazon's editorial review on one point - about this being "the best visual treatment of this opera that anyone's ever likely to see." I highly doubt that: Not only is the lighting very dark throughout and the picture not widescreen, one would think that, for a DVD, the producers would film without an audience as has been done for several other opera DVDs in my collection. I remember this production being televised in the mid 1980s and what impressed me was that it was done on a set rather than on a stage. There was no audience, so it was basically a movie of an opera rather than a video of a stage performance. I don't know, if, as in the making of movies, there were multiple takes until the producer (Franco Zeffirelli) and director (James Levine) were satisfied or if it was recorded straight through, as a stage production would be. Regardless, I think the movie style production worked extraordinarily well. Such a production allows for great cinematography, such as closeups of the facial expressions of the singers and switching camera angles, etc. Stratas is compelling, her performance both vocal and acting is moving. Her facial expressions indicate that she truly feels the role as a great movie actress would. Obviously, in casting an opera, paramount is the artistic ability of the performer, not the physical characteristcs. Thus, "the fat lady" often sings when if her character were cast in a play or movie, someone younger and more demur would be tapped to play the role. The reason that this movie style production works so well is because Stratas is well cast as Mimi. She is beautiful and her acting is magnificent. I'm relatively new to opera, but still an ardent Carreras-fan who thinks his singing is heavenly and I think he makes a more than convincing Rodolfo here. And his looks at the time is certainly no drawback for him. His acting skills are in my opinion very good; his facial expressions projecting his feelings perfectly. (I prefer a subtle actor instead of someone overacting to compensate for poor voice. )It's heartbreaking watching and listening to him singing in the final scene where Mimi is dying. I can't help but being almost as crushed as him when he realizes that she's actually dead. Since I'm not an "educated" opera-listener I can't say it bothered me that he had transposed down "che gelida manina". His singing in act III is outstanding; the break-up between Mimi and Rodolfo is heart wrenching. I can feel Rodolfo's despair because he knows Mimi is dying. One of the things that bothered me somewhat in this Boheme is actually Mimi. Teresa Stratas' voice is not something I would call beautiful, by no means. And it disturbed me that she was rotating her tongue in her mouth whenever singing. But apart from that she's actually a sweet Mimi. In my opinion she's a much better actress than singer. And she certainly lookes ill enough for this part. In act IV the duet (O Mimi, tu piu non torni) between Rodolfo and Marcello is outstanding. The duets between Mimi and Rodolfo are also very moving. Renata Scotto was probably the biggest disappointment. I haven't seen her on stage before. To me she seems affected and I think she is just too much; especially in the second act. Her singing is not what I expected. She sounds shrill and squeaky, although I have to admit she sounds better towards the end of the opera. Richard Stilwell as Marcello is a gem. His singing as well as his acting is superb and he makes a very amiable painter. He is someone you would like being your friend. The two other Bohemians portrayed by Allan Monk and James Morris are superb. The "coat song" is beautifully sung by James Morris. I have watched this film a few times and each time I discover something new. I have to say I love just watching the facial expressions of the singers, especially the four bohemians'. Sometimes you just get a brief glimpse of it, but it's still hilarious. (Like the look on Carreras' face when the land-owner Benoit knocks on the door in the first act.) I'm sure I will discover a lot of other things about this Boheme the next time I watch it, which probably will be very soon. The more I watch, the more addicted to it I get. Still, I give this Boheme 5 stars. Earned by Jos�� Carreras and James Stilwell, mainly. And I can easily put up with the flaws of this Boheme just to be able to watch and listen to Carreras singing the part of Rodolfo. Being a brand new opera afficionado I could never really understand why Jose Carreras is so loved by the opera public. But now I understand! He is so believable, his singing and acting is done with great emotion and tenderness. Theresa Stratas is excellent as usual, very dramatic and emotional. I just wish she wouldn't have looked so sick already in the first act. Scotto is a brilliant Musetta, a joy to watch. The production is unbelievably extravagant. I forgot at times I was watching a staged version rather than a film. Very well done. 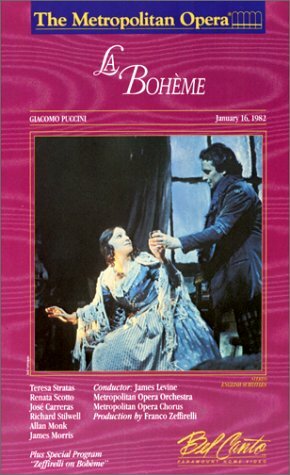 Just for the record, this is a video recording of the performance of January 16, 1982 at the Met, which features Teresa Stratas as Mimi, Jose Carreras as Rodolfo, Renata Scotto as Musetta, Richard Stilwell as Marcello, James Morris as Colline, Alan Monk as Schaunard, Italo Tajo as Benoit and Alcindoro, and Dale Caldwell as Parpignol. James Levine conducts. Being a Opera fanatic, tenor fanatic, Puccini fanatic, Verdi fanatic, etc. etc. , I find this production dreadful. Why DID the Met chose THIS?? Jose Carreras is not as good as he is now. His voice is scratchy, and rather squeaky during the start. Nessun Dorma and Che Geldida Mania are my favorite Puccini arias. Jose Carreras gave the worst performance of that aria I have ever heard in my whole life. Let's just say, he is so mis - cast as Rodolfo. The noise in the backround is beyond what can be accepted. There is coughing, wheezing, etc. Not my type. If you are a La Boheme fan and a Carreras fan, keep looking for another. Mostly, a La Boheme casting Pavarotti or Placido is not a bad idea to own. On stage motion has "Matrix" effect! It puzzles me that words like "standard" or "bench mark" were used in praise of this La Bohme. Just exactly what is the "standard" for this probably most popular opera? The originality of art is anything but to be constrained by some sort of standard. If the good words were for the singing, it still would be too lavish of a saying for this production, at least for "Che gelida manina", which was transposed down half a key, and even the replacing B is very short and not so exciting. There are indeed some really good singings, like Stilwell's Mercello. The singing of the two leading roles, however, leaves something to be desired. While Carreras' singing is quite dramatic, it feels that something was missing, not just the top C, but the lyrical sheen and exuberance that otherwise would flow through Rodolfo's vocal lines. Stratas has crafted a convincingly consumptive Mimi. But you'd hope she could bring a bit glow of liveliness to the character in the first two acts when Mimi was not yet too ill, after all Mimi should be a luminous figure. Stratas' lips are shaking noticeably (on DVD) when she sings, which makes you worry. Scotto played an impressive Musetta, and her great acting brought some enjoyable moments on stage. Probably my favorite part of this production is Act 2, in which there is an elaborate 2-story set (characteristic of Zefirelli), a gigantic crowd, and Musetta is brought in by horse and carriage (which I missed the first two times I watched it... see, lots of detail). The costumes were great, Mimi's make-up was too extreme in Acts 1 and 2, and I was absolutely pissed when I discovered that Carerras had transposed "Che gelida manina"!!! I had always thought Carerras was terrible, but this performance was the straw that broke the camel's back. I loved the snow in Act 3!!! Not for the average joe. I like Butterfly and Carmine but this Puccini pinches. For the diehead this may do. Not aye said the little brown rooster. If you only buy one La Boheme video, this is the one! Great production... but singers beware! There are two problems with this DVD that buyers,(especially singers)should know. Number one, subtitles, or more accurately, the lack thereof. The only subtitles available are in English and they cannot be turned off. Number two, I agree with other reviewers that Careras does a marvelous job of acting and of singing. But on this DVD, one thing he does not have that Pavaratti most certainly would is a high C! Che Gelida Manina is marked down a half-step and only goes to a B natural. The Best La Boheme Production on Video! I have been waiting and waiting for this opera to be back on DVD format. Lets get with it. I had it years ago on VHS, and now am waiting for the DVD version to be reissued. A marvelous opera with true Diva stars.